My Dept. 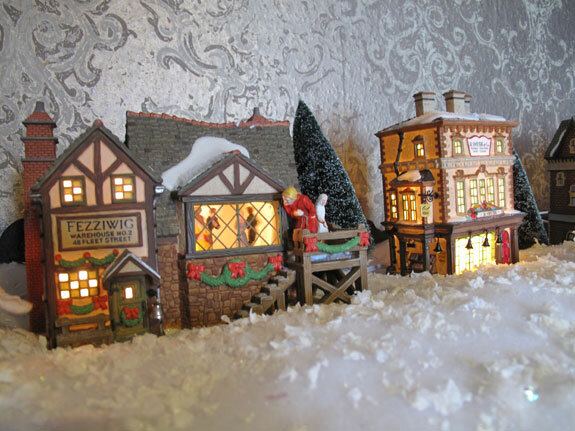 56 Dickens Village houses look right at home next to the vintage wallpaper in our 2nd floor sitting room. There’s something really magical about decorating for Christmas in an old home. My house was built in 1892. When we bought it in 2007, we were told by the previous owners that their family lived in the home for 90 years. Ninety years! I think about the fact that our house has endured more than 100 years of Maine winters. That’s pretty impressive. But, it has also been the host for the same family for 90 Christmases. Many of the big, old homes in my neighborhood have gone through their share of owners, being converted to multi-family homes along the way. Some have been bought up by people like me and my husband and have been renovated, converted to single family homes and updated for the 21st century. And then you still have a few people, like my 80+ year old neighbors, who were born in the same house in which they live. 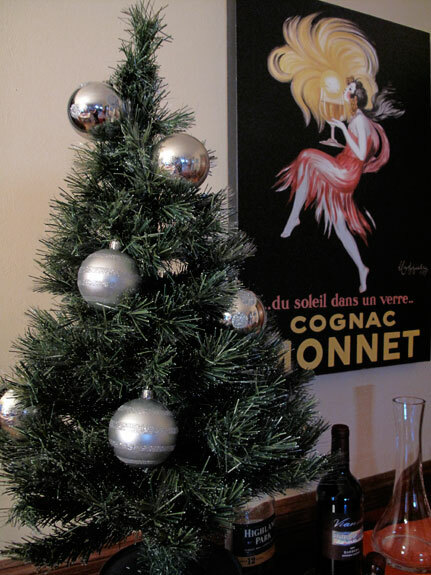 Our little tree looks nice next to the vintage French advertising poster repro. It’s fun to hear the history of the neighborhood. I found out, for example, that the great grandfather of our older neighbor around the corner was the doctor that delivered the previous owners of our home. And our next door neighbors! A lot has happened in my house, I’m sure. People were most certainly born in it. And, I’d like to think that there were many happy holidays celebrated within these walls. (We’re lucky in that the previous owners, though they separated the house between sister and brother, did not kill the character of the house with too many renovations throughout the years.) With so many cozy rooms, I picture kids and adults eating lots of food and enjoying each other’s company. As we decorate our old home, I can’t help but feel that the same decorations that were in our previous home (built in 1987) look a whole lot better in this one. Here’s to many more years of memories for this family in our big, old magical home.